whole line of Mariposa baked treats. by Saidi Granados. This is the first gluten-free product to ever be named a Top Pick Of The Week, and the second “restricted diet” food. 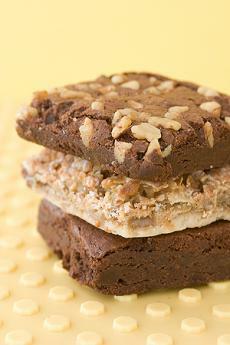 * But these brownies, coffeecakes and biscotti are good enough so that anyone can enjoy them and ask for seconds. With more people discovering they have gluten allergies, we want any of your friends and acquaintances who have such restrictions to know about Mariposa Baking Company. *Divvies Cupcakes, a prior Top Pick, are dairy-free, egg-free and wheat-free. Some other Top Picks are naturally gluten-free because no products containing gluten are used in their production (e.g. olive oil and soft drinks). Recommended by a NIBBLE reader, this bakery in Oakland, California, is a marvel. We taste quite a bit of gluten-free, sugar-free and fat-free baked goods, hoping to discover ones that taste good enough to recommend to people on restricted diets. Our standards are that they have to be good enough for everyone in the household to enjoy. Whatever magic is being practiced at Mariposa Bakery, these wheat-free, gluten-free brownies, biscotti and coffeecakes can be enjoyed by anyone. So even if gluten-free isn’t your food focus, take a minute to think of someone who will appreciate you forever for forwarding this review. Read more about Mariposa’s delectables in the full review. And take a look at more of our favorite baked goods in THE NIBBLE’s Cookies, Cakes & Pastries Section.